European Championships Management wished to gift each of the winning nation federations with a high value item to celebrate their part in their nation’s victory securing the winners trophy. A replica trophy would have been prohibitive and it didn’t feel right. We proposed a stylish commemorative plaque that could be wall mounted or displayed in a boardroom cabinet. Continuing the dynamic triangular design theme, the plaque is formed of a stunning prism shaped crown machined from solid aluminium. The satin finish gold crown is identical in size and shape to the crown from the top of the Winning Nation Trophy, laser engraved with the host nations and the tournament emblem. The crown is mounted to a machined block of solid Scottish oak representing Glasgow as the primary host nation. 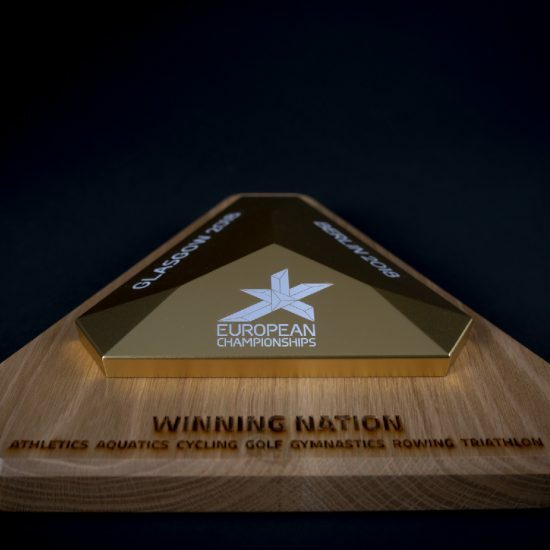 The oak is sealed with a satin varnish and laser branded with a deep inscription of all the seven represented sports at the European Championships. The trophy will be held by the winning nation for four years before being returned for the next Games. 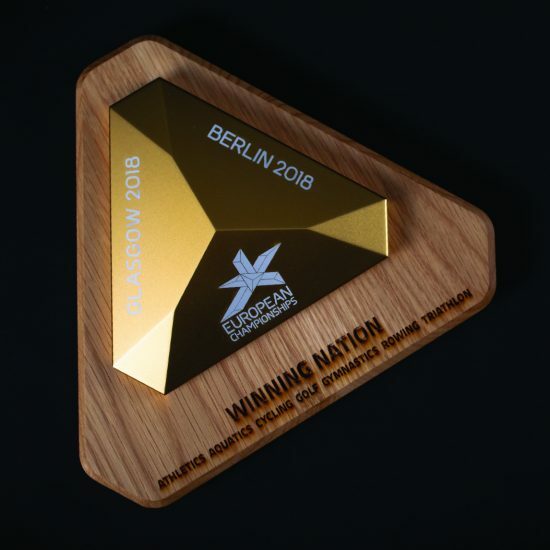 By featuring the crown from the trophy, each plaque allows the winning federations to own a piece of the victory forever of this inaugural 2018 European Championships.